Plan to be seen. A people-centric strategy is key to winning attention, and engaging with people in a compelling way. Our consultation and strategies are an essential platform to gaining the advantage. We bridge the gap between marketing and design, employing marketing tactics to make sure your promotion is as engaging and compelling as possible. We look at how people come into the equation and create something they relate to. Our brand strategies, website and other campaign strategies means that we can plan to get you the most effective type of attention. We also utilise various online marketing techniques such as email marketing, videos, animation and other content marketing including blog articles, social media and infographics to create an enticing brand story. We also provide SEO (Search Engine Optimisation) but it’s not about being 1st place on Google. 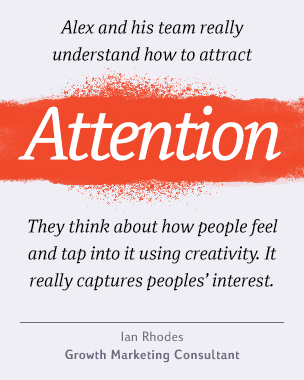 Quantity of visitors isn’t enough – you still need to earn attention to make a sale. Bringing quality traffic to an exciting offer, along with showing how you want users to respond are the key ideas that often get lost with SEO campaigns.